6 weeks ago we called upon civil society to help us secure the future of Refugee Education Chios. Our crowdfunding campaign has been an outstanding success - with over 230 individuals coming forward and making an online donation. Together we have raised 60,000 CHF through the online crowfunder. Moreover, the continued sharing of the campaign and awareness raised through our volunteers and supporters has helped mobilise different groups and foundations across the world to drive us even closer to our initial target. We are very honoured and thankful for such widespread support. However, the education system we have set up is a long-term commitment that requires a sustainable plan. After seeing the initial success through our crowdfunder and the continued denial of the Greek Government to educate the children on Chios, we are aiming to raise funds so we can be fully operational for as long as possible and as long as needed. As such, we need your support to go the full distance. Please, keep the momentum going and support our crowdfunding campaign by donating through PayPal. Click the donate button on top and help us ensure these children receive an education in Chios. 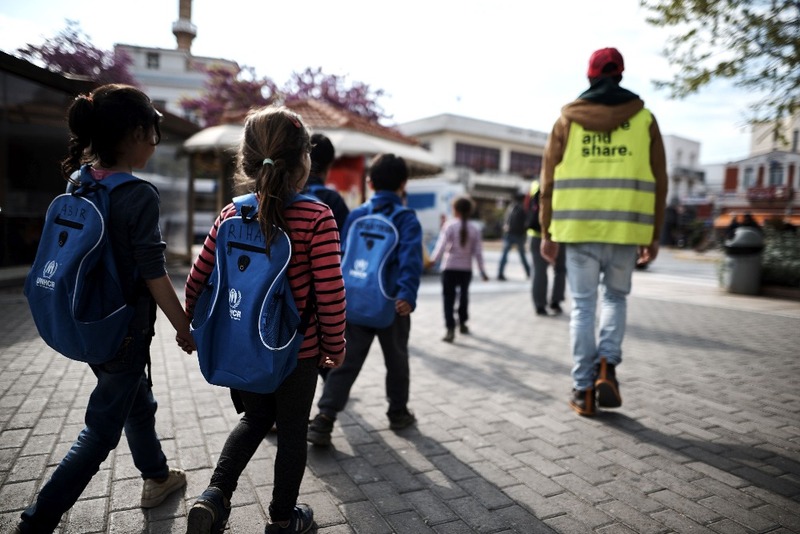 We are the largest education providers for refugee children on Chios Island in Greece. Over the last year we have educated over 1,300 children and teenagers who otherwise would not have been able to access any form of education. Up until now we have been largely funded by the European Union. However, it has been recently announced that this money will now go to the Greek Government instead. With no plans from the authority side on how they will integrate the children into the Greek public school system, we are still required to continue on the Island despite the lack of financial support. We have 6 weeks to fundraise CHF 120,000 (Swiss Francs) so that we can continue operating until the end of the year. With your help, we can continue to uphold the children’s fundamental right to access education. Following the March 20th 2016 EU-Turkey deal, Chios became a de-facto detention Island. Refugees, who arrive on Chios after making the dangerous journey across the Aegean Sea, are kept in inhumane conditions as their future is decided by the asylum authorities. Around 40% of those stuck on the Island are below the age of 20 years old. They are denied access to formal education and there continues to be no plan of integration. This is different to the mainland where many children can access public schools. Many children have been out-of-school for years or have never been to school at all due to the war, violence and instability. Such a level of disruption to learning threatens to have a long term impact on children’s cognitive and social development, wellbeing, the acquirement of essential life skills, and their overall future. 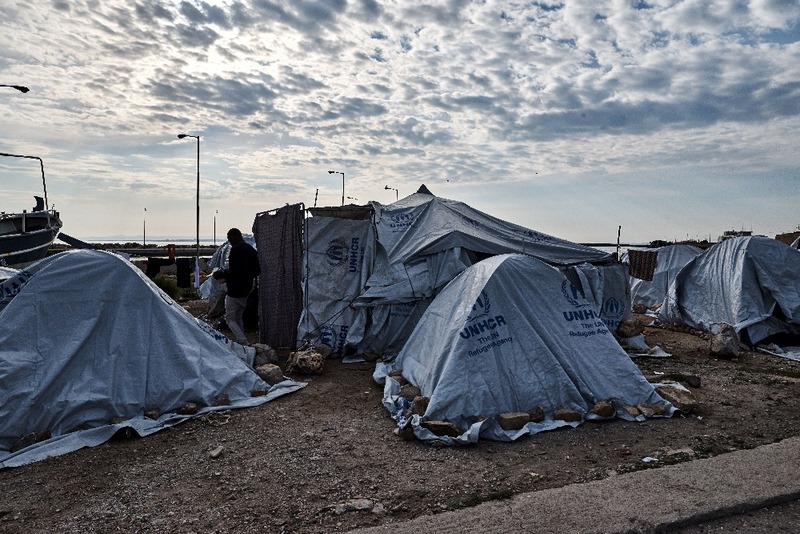 Souda Camp in Chios. Many families sleep in absolute inadequate conditions on the beach just outside the main camp. Be Aware and Share is a non-profit organisation from Switzerland founded in October 2015. For nearly 12 months, we have been operating the largest non-formal education system for refugee children and youth stuck on Chios Island in Greece. Without our education system, children and young adults would have been stuck in the awful and inhumane conditionso of the camps with little access to any schooling, social support or leisure activities. At the heart of our project is providing a safe space outside of the camps where children and young adults can develop, learn and grow. Primary school (6-11 years old): we provide a child centred curriculum which develops the foundational interpersonal and educational skills needed for their future integration into formal education. There is a combination of structured/teacher-led and child-led activity differentiated to meet the varying learning needs of the students at any given moment. High School (12-20 years old): the high school is heavily focused on creating choice, and allowing the students to design their own curriculum through the different options. We aim to create an inclusive environment, ensuring all levels and abilities are catered for. Youth Centre (14-22 years old): the youth centre offers a safe space for teenagers, focusing on the development of trusting relationships and confidence regarding their own abilities and skills. The teenagers, who are otherwise often exposed to violence and neglect, improve their conflict management, non-violent communication and group-based decision-making with all activities conducted at the centre. Cooking school (18+): The cooking school is a vocational skill based learning centre that provides a month long cooking course where 6 individuals from the refugee community can develop the basic professional skills of working in a kitchen. We partner with the incredible team at Chios People's Kitchen to develop the skill set and experience of our students. With no plans from the Government to integrate the children into the Greek public school system, our project remains as relevant and needed as ever. With your support we can continue our education system and ensure every refugee child who enters Europe via Chios can attend school even when the formal systems fail. We need your help to be able to continue filling this gap until the Greek Government establishes a sustainable plan. Be Aware and Share is extremely cost effective. 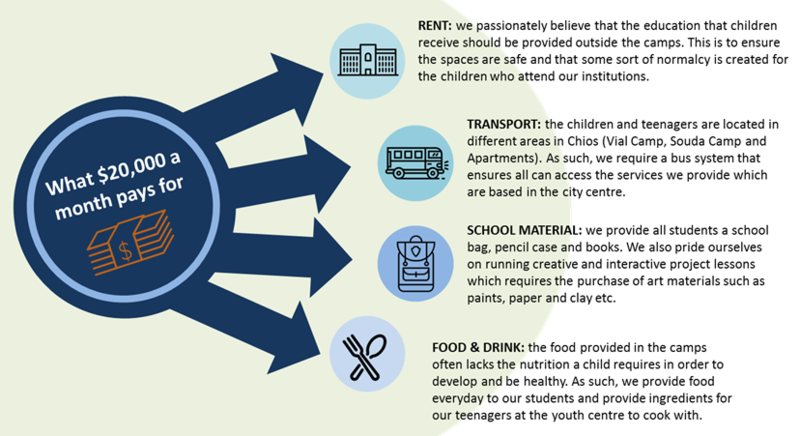 We have low administrative costs, all of which are already covered by existing donors. On the 23rd of May 2016 the first BAAS school opened its doors to around 25 children. Acting upon the great need, we soon extended our services and since November 2016 we have run two schools, a youth center and a cooking school. We reach up to 250 children and youth between 6-22 years old per week and since opening have educated over 1,300 children and teenagers. We have managed not only to provide the children with a safe space away from the camps, but have also seen their behavior, social well-being and communication improve on all levels. Our project has managed to create a flourishing ambition for learning and discovering own abilities, talents and interests. This way, we have successfully prepared hundreds of children for integration into formal school systems in Greece and other European countries. Our students walking to School from Souda Camp. Education is not only a fundamental human right, to which every human being is entitled, it is the cornerstone of our prosperous and peaceful societies to which the children we educate now will contribute as our fellow citizens. By enabling children to pursue their talents and ambitions, to develop socially and become self-determined, we set them up for success and ultimately prevent this generation becoming completely lost to war, violence and instability. To thank you for your donation, we would like to offer you a gift! Please message us with you name and address once you have made a donation. If you do not message us at donate@baas-schweiz.ch, then we cannot provide you with your gift. The costs below are to the best of our knowledge given our experience to-date. This is our monthly budget. Yes, Be Aware and Share is a registered non-profit in Switzerland. We are raising in Swiss Francs (CHF) to avoid currency conversion fees. What countries are the children and teenagers from? Most of our students are from Syria, Afghanistan and Iraq. However, we also have students from many other countries such as Yemen, Kuwait, Iran and the Democratic Republic of Congo. For how long do you think you will be providing educational services on Chios Island? We will provide educational services until a more suitable solution is established to educate the children who arrive on the Island. At the moment, no plans have been announced. GoFundMe accepts all major credit cards. However, the education system we have set up is a long-term commitment that requires a sustainable plan. After seeing the initial success through our crowdfunder and the continued denial of the Greek Government to educate the children on Chios, we are aiming to raise funds so we can be fully operational for a year and not just six months. As such, we need your support to go the full distance. and help us ensure these children receive an education in Chios. To thank you for your generosity, we will send you an exclusive Be Aware and Share Thank You Post Card from Greece. To thank you for your generosity, we will send you a surprise Be Aware and Share gift. To thank you for your generosity, we will send you an exclusive Be Aware and Share Wristband. To thank you for your generosity, we will send you a BAAS Merchandise bag that includes a branded bag, wrist band and t-shirt. To thank you for your generosity, you will be listed on our website as a BAAS Supporter and receive an exclusive BAAS “coffee table” book. To thank you for your generosity, you will receive the same perks as a supporter but also be listed in one of our schools on our sponsor plaque. No need to send anything to me. I'm ok with it. M&A2017 Thank you for your important work!